Like L. Frank Baum and Lewis Carrol, Catherynne Valente creates a modern fairy tale invested with the collision of traditional elements and modernity. 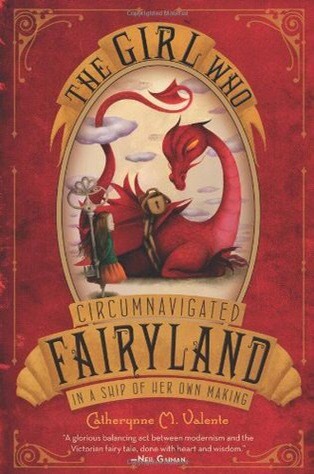 The Girl Who Circumnavigated Fairyland in a Ship of Her Own Making is imbued with all of the whimsy and wonder of The Wizard of Oz and Alice in Wonderland and the estrangement from the mundane world that adds a taste of awe to the concept of the fairy realm. Her Fairyland is not a place of perpetual tea parties, gowns, and cordial attitudes, but is rather a place that heightens the reader’s and the protagonist, September’s sense of displacement. Everything is open to question in this realm of fluidity, change, and mystery and the landscape itself is written over with a sense of whimsy. Valente links two types of whimsy tales – the fantastic, and island narratives. Her story is a portal story, a passage from one world into another (Fairyland), but this sense of the mysterious, the separate, and the exotic is highlighted by the further representation of Fairyland as an island that can be circumnavigated. Literature about islands tends to have this sense of exoticism, constructing islands as places of escape from the realities of the world, places of separation from the normal, and places where limits can be tested. Being surrounded by water, they are often portrayed as locations of isolation and distance and are encoded with metaphors of separation, often written over the water as a distancing tool. September’s experience of Fairyland is marked by a sense of loneliness that has shaped much of her life and she encounters other isolated and lonely beings who feel cut off from the “normalcy” of their society. She is able to create bonds between these lonely beings and feel a sense of belonging. It is through her island encounter – through her encounter with the isolation of the island – that she is able to create community. Valente’s Fairyland is a much more distant island, requiring the passage out of our world to reach and when September passes through the barrier between worlds (which she has to go through a fairy immigration officer for), she is dropped in the water near the island shore and has to swim her way onto the island. Valente reinforces this shifting nature of the shore by having the beach shift constantly – not from the tides, but rather from the shifting nature of the landscape itself from sand to gold and jewels, representing the uncertainty of island borders. September is a character who is shaped by what she has read. Her extensive reading of fairy tales and fantasy has given her a perspective of what she should expect from her own tale and this knowledge both guides her and also deceives her. She is constantly searching for confirmation that she is “special” because she knows that special kids are the ones that are chosen for fairy tales. She fears that she is ordinary and therefore keeps seeking confirmation of her Otherness, and yet she also doesn’t want to experience the separation that comes with Otherness. She uses her knowledge of tales to guide her path through the realm, realising that in tales people who seem to know where they are going eventually reach their destination, so she plays her roles, acting as though she knows where she is going so that the landscape shifts to bring her to her destination. By doing this, Valente is playing with narrative itself, critically questioning the assumptions underlying fairy tale narratives and inviting the reader to develop a critical inquisitiveness that allows them to challenge tales. Valente constructs a travelogue into the fairy realms, a tale of adventure, and yet it is also a tale of sacrifice, blood, and loss, confronting the realities of isolation, feelings of abandonment, and the horrors of being rejected from a world where one finds a space of belonging.